Throughout the Cold War, democratic and communist nations waged a “war of ideas.” The United States, seeking to expose the disadvantages of communism and to encourage democracy, engaged in numerous media campaigns targeted at influencing peoples in zones of Cold War conflict. The U.S. State Department, along with branches of the American military and other government agencies, published leaflets, newsreels, films, articles, and cartoons in numerous languages around the world. 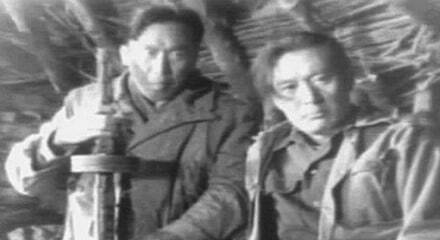 During the Korean War (1950-1953), this use of soft power was intended, in the words of Public Affairs Officer James L. Stewart, “to create democratic-minded people in Korea friendly to the United States.” For much of the war, the State Department’s domestic film-making campaign in Korea was headed by a single American, William G. Ridgeway, and staffed by dozens of South Koreans who had reinvented themselves as film industry workers. 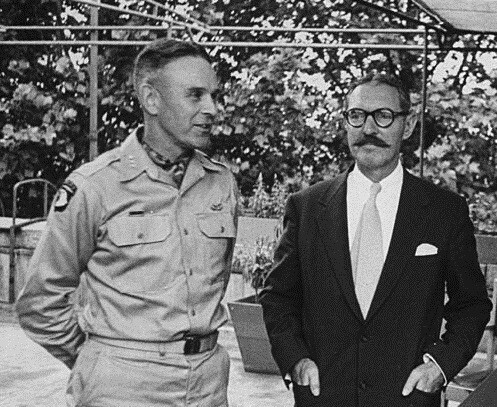 Ridgeway played a key role in sharing American ideas and shifting South Korean sentiment against communists as the Motion Picture Officer in Korea from 1950-1958. It was far from an easy task; he contended with an evacuation from Seoul, a severe dearth of equipment, and local cultural norms. In an interview with G. Lewis Schmidt in February 1989, Ridgeway discusses the films and newsreels he produced and the evolution of the film production process. Please follow the links to read more about Korea, East Asia, USIA, or to read an account of the North Korean invasion on June 25, 1950. RIDGEWAY: I was able to have myself transferred from AFRS [Armed Forces Radio Service] to the motion picture section of the Army’s Information and Education division…. In January 1949, my organization was taken over by the Department of State from the U.S. Army. At that time, my own personal problem of trying to obtain permission to marry [a Korean woman] improved. Under the Department of State, unlike the Army, it was possible to apply for permission [to marry a foreigner], which I did — and, incidentally, including a copy of my resignation. If I was turned down, they would accept the resignation, and I would be shipped out. We left [Korea] on June 10, 1950 for the U.S. — my first home leave and my wife’s first visit there. We were in New York City two weeks later, when on June 25, 1950, the North Koreans invaded the south…. I went to work in our New York City office and worked there until October, when I was given the assignment to return to Seoul as motion picture officer. Chuck Tanner apparently refused to return to Seoul because he couldn’t bring his wife. No dependents were allowed at the time. So I went back [to Seoul alone]. The city, needless to say, was quite different from the one I had left…. So, he said, “Well, try to get what you can together, and get the movie thing going.” My original staff and the motion picture production staff were able to find out where the communists had stashed our raw film stock and pre-print material. We literally went around and picked up all of the stuff that they hadn’t taken north. Fortunately, we were using 16 mm. film exclusively with our mobile units, not 35 mm. They had left the 16 mm. and taken the 35 mm. stock and prints….The equipment, which really was nothing to brag about, we recovered. So we got the operation going. Our first production was a three reel, or thirty- minute, film on the progress of the war. Then the roof fell in. 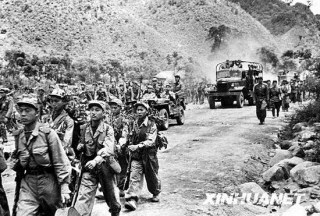 The Chinese communists got into the act and started the next round of the invasion. By this time, it was in the dead of the winter– mid-December. We were faced with the problem of finishing what film prints we were making and, at the same time, starting to evacuate. 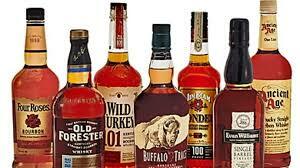 I used seven bottles of whiskey to obtain seven boxcars from the U.S. Army sergeant in charge of boxcar assignment. At the railhead, we loaded the boxcars with all of our equipment, the employees and their dependents — a total of 350 people. One by one, they were shipped off to Busan — final destination was Chinhai. I shuttled back and forth between Seoul and Chinhai, hitchhiking on military aircraft. Everything on track, I left on the final trip out of Seoul somewhat after Christmas. The city fell to the second invasion in a few days. We went to Chinhai because we had a small Information point (Center) that was to serve as our new studio! The building was the former Japanese naval officers’ club of Chinhai, of typical Japanese construction with sliding paper doors — a real fire trap! We put all of our stuff in the building and tried to place our people around town, wherever they could find room for their families. By this time, headquarters had evacuated from Seoul to Busan. I went to see the PAO to report that we were down, et cetera. He asked me what [I needed]. I said we needed to fix the place up and make some rooms light-tight, and bring in water and electricity. I already had made some preliminary estimates of what it would cost. The plan was to do the work ourselves. All of the Korean staff members had other skills, because in those days almost all of the people in motion picture production started off as floor sweepers in commercial theaters. There they were able to work their way up through the ranks, so to speak. Most of them had little or no formal training in any of the arts. To have been a bricklayer earlier and a scriptwriter today was quite normal. Consequently, we had a large reservoir of talent in the organization. I had a staff of about eighty-five people at that time. 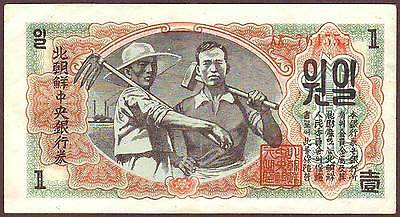 I put the money in a bank in Chinhai, and we started to fix the place up. It took about six or seven weeks, and we were back in business again…. As I said, the “studio” was a fire trap. We insulated it against sound the best we could. We built a soundproof booth using rice hulls for insulating material between double walls. For the glass in the window of the soundproof booth, we used jeep windshields. It was all improvised. We also scrounged a lot of stuff from the air base that we were able to use. I worked out a deal with the U.S. Air Force at the Chinhai air base, a few miles away…to borrow a 16 mm. automatic film processing machine. None of the equipment we were using at the time was automatic. The machine was very helpful to us because we could produce our 16 mm. prints faster. We also used it to process their gun camera film. Normally, they were shipping their gun camera film back to Japan and not getting the film back until the following day. By processing the film the same day, the pilots could see the effectiveness of their strikes, before the next mission. The base had the equipment but not the know-how. They had no one who could run it or whatever. So we scratched their back and they scratched ours. It gave them almost immediate access to their gun camera films after a strike in the north. The pilots were well served, as were our own needs. You may wonder why a film-processing machine was such a prize. All of our film was developed in two hundred-foot lengths on curtain stretchers dunked in wooden tanks by hand, with no temperature control of any sort. In the winter, the soup (developing chemicals) literally was put in large GI aluminum pots and heated over a GI gas stove. It was then dumped back in and stirred around to bring the temperature up to the approximate degree it should be. In the summer, it was the same thing — the pot was floated in cut-off fifty-five gallon drums of ice and water to cool it off. We ran three eight-hour shifts and worked seven days a week. As I said, we had no modern equipment. It was all done by hand. The film came out of this mess coated with a very thick scum. 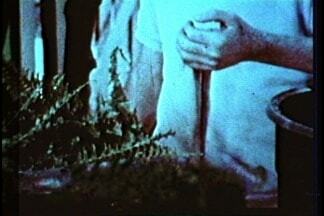 We hired young girls who did nothing more than scrub every inch of film with a mixture of ammonia and alcohol. Every inch of film was scrubbed that way. Since the film was broken down into two hundred-foot lengths for developing, it had to be spliced together for the next step. When your sound is on one piece of film and your picture on another, little bits and pieces were always missing. To correct this, we went through the horrendous mess of sound matching, which would take a week or more to do. All of that to complete a ten-minute reel of film! [The actors were all locals, a mixture of professional actors and others.] What we would usually do would be to go into a village and talk to the head man and explain what we were doing — sit and drink some sake, tea or something, and discuss the film and point out how it was helping the war effort. This would take quite a bit of time. We would get his cooperation and the cooperation of the villagers. 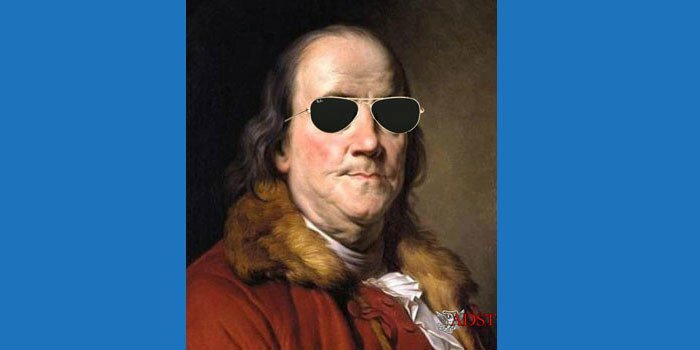 We would usually pay a little bit, not too much — pay them as laborers, but really for the services of using their house and their village or whatever…. [The studio in Chinhai] worked out quite well for, oh, about a year. We were producing a weekly newsreel, and I think by that time, we had even started to produce Korean adaptations of American films…. 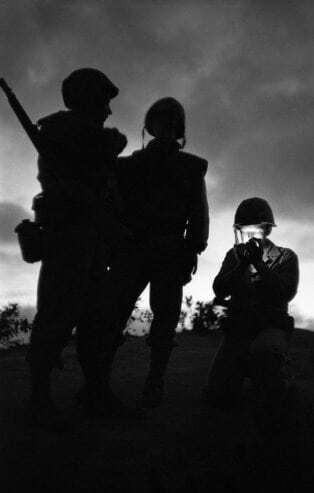 The newsreels that we turned out were designed to support the efforts of the Korean government and the U.S. in fighting the war. It was clearly propaganda. We called the communists just about every vile name you could think of, and used all kinds of statistics and facts that would bolster morale. It was the Korean government’s policy to foster hatred of the communists. I questioned some of this myself at the time, because the most dangerous communists, outside of someone coming at you with a tank or a gun, were the ones you could not identify. The most dangerous ones were the ones working under cover, and there were a number of them. 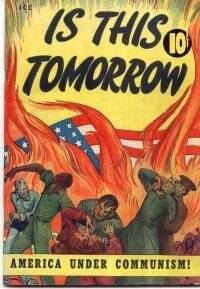 It was a story showing how the communists used an agent in the guise of a young wounded veteran. He came to the village carrying the ashes of a young man who was from the village. He had been allegedly killed in combat — actually it was a cover. That was the first time, as far as I know, that this particular approach was used in trying to point out — a communist could look just like you or anyone else. 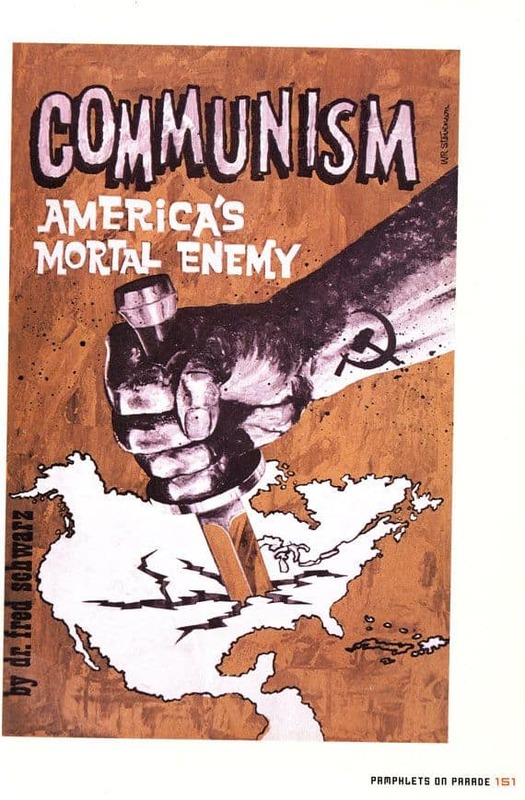 The Korean government posters would show the communist as a bloodthirsty monster, with a knife clenched between his teeth and a knife in each hand…. The documentaries that we made, or the American- produced films that we made adaptations of, would cover a wide range of things on government, education, agriculture methods, the United States — not necessarily always appropriate for Korea, but at the same time they would convey the idea that the government can help the farmer. We were trying to point out that the government is your friend — the Korean government is your friend — because, after all, there was a tremendous amount of very bad press that existed before the war. And, of course, the communists left no stone unturned to paint the government in the worst light possible. The government had a pretty poor, well-deserved reputation from the beginning, making it easy for the communists…. [Because] many of the American-made films contained concepts that were complicated or difficult to get across, I started an introductory series for use with such films. 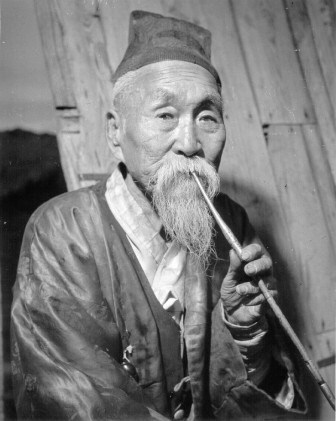 We used an actor to play the role of “a grandfather” — you know, the chap in the black horsehair hat and with the long bamboo pipe. The character was called — “Haraboji” — grandfather, an authority figure that would command respect and would be listened to. This character would introduce a film live, in a setting appropriate to the subject, and explain something about the content that was not apparent in the original. We used his live sound along with the Korean soundtrack of the original film. His explanation would put it in a context that the people could understand. That was much easier for us to do than to re- edit. [Re-editing] was impractical to do anyhow as we wouldn’t have access to the pre-print material. This was cheaper and easier to do and much more effective. We would have a little — oh, maybe a three-minute intro, and then at the end of the film he would come back on again, with about a minute or two. He would reiterate, “This is what you should have understood or learned from what you have seen.” An example would be, explaining something as complex as the United Nations, or a film about the United States. We made, oh, several hundred of those. 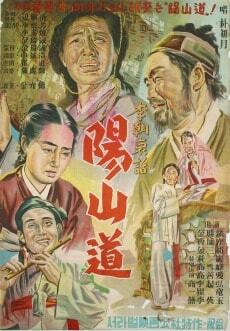 In fact, the actor who played the part became quite famous in Korea for his role as “Haraboji,” the grandfather. Oh, yes, [he went on to a commercial career]. It worked out quite well. There were a number of things we did that were not normally done in the film business, but we had a war going on and then we had the reconstruction period after the war. The important thing was to get the material out in a form that could be assimilated by the people. We would invite people from the nearby village. They would come and look at it, and when the showing was over, we would question them to see if they understood the points we were trying to get across. If they didn’t, we would change the script, and/or change the cut. Sometimes we would do that two or three times. It allowed us to produce a product suitable for our target — the villager. This way, we were able to come up with a product that communicated the ideas we were trying to get across, about reconstruction, health, sanitation, or whatever…. While I was still in Korea, for all practical purposes until I left in 1958, I decided what went into the reel and its contents. The finished prints would go up to Seoul each week. It wasn’t practical to review a weekly reel. Communications were very poor, and certainly not secure for classified discussion…. [There was] really no communication in those days, you see. It wasn’t until the last two years, I think, that we were in Sangnam that we finally were able to obtain a single side band radio. We were able to link up with the other field posts and Seoul. Of course, you couldn’t discuss anything classified. We did not have a classified courier service, either. Also, it was just plain common sense what we were saying and doing…. We only had one of our newsreels held up by the Korean government censor once. We were telling the exact unpleasant truth, and the government did not want to have it shown. It was about a political rally by the opposing party, and the government had said in the media they controlled — the press and radio — that only a few thousand people showed up. Well, in our film, you could see people as far as the eye could see. Obviously there were far, far more than five thousand people…. [The Korean government censor]…just held it up. They held it up for a week or two, and then they allowed it to go out. The National Assembly voted to lift the ban. Quite a vindication…. The next phase of our development began due north, over the mountain from Chinhai, [in Sangnam]. There I found this fantastic empty building, 150 foot by 50 foot wide, two stories of solid reinforced concrete. Prior to the Korean War, it had been looted by the local people for all the stuff they could recover from it — wooden frames from the windows, wiring, pipe, whatever. But it was very well built. I saw this shell as a potential fireproof studio. In those days, such a building was an extreme rarity, especially unoccupied. The war was still going on. This was, I guess, in late 1951 or early 1952. On my next trip to Busan, I extolled the virtues of this new site to the powers that be. Everyone thought it was a great idea, but really a dream. It was assumed we would win the war and move back to Seoul. The idea to have film production located permanently, so far from headquarters, was not looked upon favorably. Needless to say, we did it, and we moved in. The facility was a thousand percent better, and this time, besides much better security, we were off by ourselves. We had a country locale where we literally could build sets right on our own property, with our own rice paddies and everything…. The studio site was a great bargain. I had arranged to lease it from the Korean navy for ten years without charge — a free lease hold arrangement. We paid no rent or anything, so it was a very good deal — and we were able to extend the lease indefinitely…. During the time we were building our studio, the ingenuity of the staff became quite apparent. We could make almost anything, and often we literally did. We constructed a film printer, for an example. We obtained scrap aluminum from the air base and melted it down to make castings. They were machined in our own machine shop, where we made the parts and created a piece of machinery that would cost $10,000 to $15,000. We did it in our spare time for a few thousand dollars — most of that spent in the U.S. to buy the parts we couldn’t make. We could keep almost anything running.… [The automobile we used as a camera truck—there] was always something going wrong with it. We modified it with cannibalized parts from U.S. trucks; it eventually ended up half or more an Army three-quarter ton truck…. [It] is very interesting to look at the progress the country has made. We are talking about a major industrial power that has gone from an ox cart economy to supertanker construction — in a few short years. The Koreans, I suppose because of necessity, were great improvisers. They seemed to be able to understand how things work quite well, so I am not at all surprised to see how they went literally from an ox cart society to four lane superhighways. Almost anything you buy there is made in Korea…. [The] Sangnam [studio] proved the viability of the concept and the need for facilities to produce on-site informational film material, and to do adaptations of films about America. It provides the immediacy and the current local language being spoken at the time. Most of the films we received from Washington, voiced in New York, were with the wrong accents, and described things with words that were long out of date. It also was far cheaper [to make films in Korea]…. We did a lot of shooting in the studio – now, we had a real sound stage for the first time. It was well soundproofed. All the pieces began to fall together. We began receiving the modern automatic development and printing equipment that I had ordered from the U.S. For the first time, we were properly equipped. My serenity was soon shattered. All of the lab chiefs went on strike when the new processing machine arrived. They thought they would lose face in not knowing how to operate it, so consequently, they quit. I don’t know what they really expected us to do, but anyhow, I was able to train their assistants on the new machine. That was the end of the old lab chiefs and their strike. They all had their own special formulas which were closely guarded, even from each other. It was assumed we would be helpless without their know-how. The film that we processed by the old system was terrible. 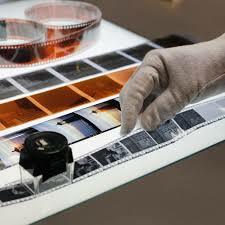 A particular scene would go from white highlights and pure black shadows to absolutely flat gray because of the difference in processing the film at different times. So, finally, for the first time we were now able to turn out reasonably good quality, consistent photographic material — and, best of all, at the same time, at a much greater pace. 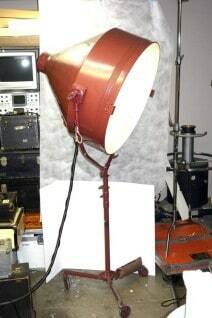 The new equipment included sound recording equipment that used magnetic film. 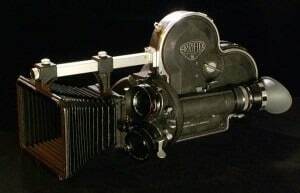 We no longer had the problem of matching two hundred-foot lengths of film together — everything was done on one big one thousand-foot roll, what an improvement! The staff absorbed the new techniques. We literally hired young girls from the rice paddy and trained them in how to run the film printers. They were much better than the men. First of all, they followed instructions and didn’t have to unlearn anything, like some of the older movie people. A good two-thirds of the staff [was] originally contract employees. I had placed them all in Foreign Service Local positions when I took over, as the contracting was a dodge, and a convenience for graft. Their former boss, the contractor, was now chief local. He did not like it at all, because he no longer was making a lot of money. He was a constant problem, but necessary, as his age and former position insured staff loyalty. The new people we hired and trained followed “clean room” rules carefully and were much better employees. I knew the ambassador liked very dry martinis and insisted on mixing them himself. Fortunately, in the things we had brought from the States, we had included the usual Foreign Service necessities — glassware, silverware and other stuff for fine dining, of course. We had just arrived at the studio in Sangnam only a week or two ago, and everything hadn’t been unpacked. So while the ambassador was on the way (I had not been notified he was coming until he was on the way), I was busily unwrapping martini glasses we had in a cabinet. Then, I put them out — I don’t think my wife had even noticed that. So, after the ambassador arrived, the first thing he wanted was all the mixings. I brought the glasses out, and my wife was making funny waving motions at me. I didn’t realize what it was, but apparently the glasses were very, very dusty. You know, I had too many things on my mind, and the last thing I would notice was the condition of the glasses, I suppose. So I put them out for the ambassador, and he — if he noticed it, he ignored it. A real diplomat! They had lunch with us. The kitchen stove had blown up just before he arrived, and we had black soot slowly filtering down all over everything. These things would only happen when you have a VIP like that. It was quite funny, but not at the time. He was a very fine man.…The ambassador asked me many questions about my operation, and actually briefed me on the political situation. He seemed very pleased with what we were doing. I was the only American there, and everything was running well. Ambassador Briggs had that wonderful ability to make one feel they were part of the team and important. It was a day I shall never forget…. Overall, I enjoyed my career in film making to the utmost. [I] served during an exciting period in U.S. history, in a part of the world that is front stage today. I believe the efforts we made during the formative years of those countries have helped advance important American ideals. Democracy, in various stages, is certainly on the rise worldwide. We participated in mass media control, perhaps the most important (and dangerous) tool for social purpose. Examples of such use, both for the good and the bad, surround us today. Elements of political and religious fanaticism still exert undue influence. Only time and the unfettered spread of ideas will tame the Lorelei that would still entrap us. We have a good start. The force of reason should eventually prevail, rather than reason of force. We were there at the beginning — what more could one ask?